Alfred was educated at Lewes Road Council School at Brighton, then became a Grocer�s assistant by trade. He was rejected for service in the army on medical grounds thirteen times, then on 3rd October 1916 was called up and posted to serve with the R.A.M.C., 35 Coy on the 9th. He was 23 years and 60 days old, and was living at �Isleworth� Garden City, Haslemere, Surrey at the time. He proceeded to East Africa in July 1917 as a Reinforcement - embarking at Devonport on the 25th July, he disembarked at Daressalaam, entering the war on 20th September 1917. He was posted for duty with �C� Section of the West African Field Ambulance, at Morogoro on 3rd October 1917. 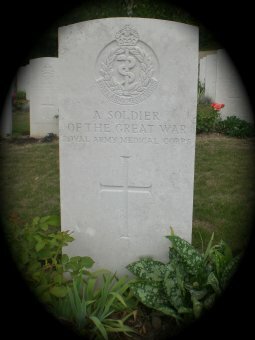 Alfred was admitted into No 52 (Lowland) Casualty Clearing Station on 20th March 1918, suffering from malaria. He was said to have been progressing favourably until the 24th, when he suddenly developed Blackwater Fever. His last moments were said to have been quite peaceful, and it was not thought that he suffered any pain. He was buried with full military honours on 29th March 1918 at the Military Cemetery at Mingoyo. Alfred was the son of Oliver and Emily (daughter of H Wenham) Moore of 57 Livingstone Road, Hove, Sussex; and the husband of Rosina Frances Moore (daughter of Henry Karn) of Wey Hill, Shattermill, Haslemere, Surrey - married at Haslemere Parish Church, Surrey on 7th June 1916.